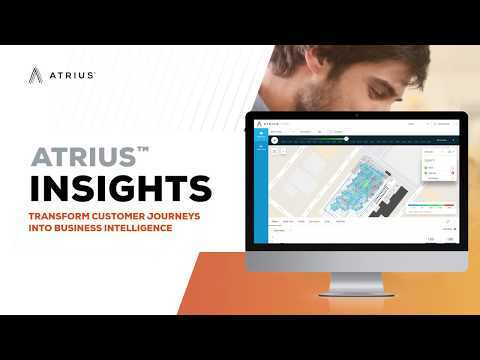 Atrius Insights platform service and web application transform indoor positioning and location-based data, acquired from Atrius Navigator or third-party indoor positioning systems, into spatial analytics, making complex relationships understandable and actionable for your business. Gain understanding of how visitors interact with your space to optimize customer journeys, analyze and predict traffic and behavioral patterns, and improve conversions. Your Data – Leverage data from Atrius Navigator or from third-party indoor positioning systems. Rich Visual Analysis – Transform real-time and historical data into map-based visualizations and heatmaps of visitor and associate locations and paths, illustrating changes over time and exactly where those changes are taking places. Multi-site Support – Create, aggregate and compare metrics across multi-site organizations. Each site is precisely geo-referenced leveraging Map Service. Designed for You – Support specific business queries and gain key performance indicators by creating custom charts.